Hey everyone! It is I, Regina, or some call me the Evil Queen. I am here to tell you what happened during In the Name of the Brother. It all started with Belle injured on the ground after Hook shot her. Her memory is gone and Mr. Gold is trying to care of her. He attempts to use magic but she does not want it. Belle cannot remember anything because she crossed the Storybrooke line when Hook shot her. Emma, Charming, and others show up to the scene. Emma speaks briefly with Hook. Hook says Rumple took his wife away and this payback. Hook is on the ground because out of nowhere a car came and hit him. As Emma is talking with Hook, Mr. Gold comes over. He uses his cane to try to choke him. However, Emma stops him. As this was going, the man who drove into Storybrooke and crashed his car was still there. They check to see if the man is still alive. He is and they rush him to the hospital. We then see Dr. Whale sitting in his office at the hospital. The loud speaker is calling him to ER, but he stays there ignoring the call. We now are back in Storybooke at the hospital. We see Emma, Snow, Charming, Ruby, Leroy and Mr. Gold. Mr. Gold is nervous and upset about Belle’s condition. Dr. Whale tells him to relax and that everything is going to be okay. Rumple heads over to Belle’s hospital room. He gently kisses her and wakes her up. She begins to yell and panic. He apologizes to her and hurries out of the room. Next, Emma heads over to Hook’s hospital room. She is sitting on his bed as he wakes up. Emma tells him how he cracked a few ribs. She also keeps asking him where my mother, Cora, is. Hook tells him that he does not know. Emma reminds Hook about how Rumple has more power in that town and he needs to back down. She leaves the room to join Snow, Charming, Ruby, and Leroy. They have the stranger’s phone. They do break into his phone and he seems to be a normal person. As they are talking, they realize that since the spell has been broken, anyone can just drive right in. They all become nervous that this stranger could have seen Mr. Gold using magic. If he did, they fear that Storybrooke will be the next place tour buses and tourists will be coming. They then talk about trying to find me. However, I am hidden underground. Dr. Whale shows up and interrupts their chat. He tells them how this stranger is bleeding in his chest cavity and is possibly going to die. Dr. Whale privately asks Mr. Gold to fix the injured stranger. Mr. Gold denies him and argues that he does not care and just leaves. Dr. Whale turns back to the group and tells them it could be easy to let this person die. They debate on if they should let this person die. Charming steps in and says this person deserves to live. Dr. Whale agrees and heads to prep for surgery. As Dr. Whale leaves, Snow tells everyone that Dr. Whale is drunk. We then head to Mr. Gold’s pawnshop. Mr. Gold is sitting there holding the chipped teacup that Belle had once broken. He then hears a noise and goes to check out the window. As he turns around, my mother, Cora appears. She asks Mr. Gold for a peace offering. She will help Mr. Gold find his son if he can help get her to me. As Mr. Gold turns away, he notices a box. He opens the box to find a white orb. This orb is what can help locate Bae. He then asks Cora if she knows a spell that can bring memories back. Unfortunately for him, Cora does not. She tells Mr. Gold that she only knows what he taught her and calls him Master. They agree on the peace offering and kiss. We head back to the hospital, where we see Charming and Dr. Whale talking. Dr. Whale is holding a watch as he assures Charming that he is not drunk. Dr. Whale steps away and Charming heads back to the group. They have the stranger’s cell phone and notice “Her” keeps calling. As they are talking about this, a hospital orderly shows up. He asks if anyone has seen Dr. Whale. They have not, so they try to page him. In the laundry, Dr. Whale’s pager goes off. They all realize that the doctor skipped out. Red takes his laundry and uses her wolf-scent to track him down. Charming reveals to everyone that Dr. Whale can bring people back to life. He tells them the story about my beloved Daniel. We then see Dr. Whale running through Storybrooke. The next thing I realize is my mother, Cora, is in my home! She is going through my things. She finds a picture of Henry and me. She comes across a ceramic handprint that Henry once made me. I then realize Henry found me in my underground hiding place. He looks at the mirror as I watched him from behind it. I cannot keep quiet anymore and I let him in. I hug him so hard and I just don’t want to let go. A cloud of smoke appears, and it was really my mother. Oh, great. My mother and I begin talking for the first time in over 28 years. My mother says it is okay that I tried to have her killed. She still loves me and she did not show me the correct way. He apologizes for everything she did to me. She tells me that when I cried over her coffin, that changed everything. I quickly take charge of the conversation. I demand she comes to town with me, regardless it was in the middle of the night, to tell everyone I did not kill Archie. She agrees and we get in my car. Meanwhile back to Dr. Whale abandoning someone on his operating table..
Ruby finds Dr. Whale by the water. He is standing there holding the watch. He throws the watch into the water and then jumps off the ledge. With Ruby’s quick wolf-like reflexes, she catches him before it is too late. Dr. Whale and Ruby sit down and have a talk. He says that Mr. Gold says magic always comes with a price, but he feels that science is the same way. Every time he tries to save a life, someone else dies. Ruby says that he is not a monster. In fact, she ate her own boyfriend. They talk about how what I did by erasing everyone’s memories for so long was almost like a blessing. However, they have a chance to start over. This is his chance to make amends. She tells him how a woman keeps calling this injured person’s cell phone. It could be someone who cares about him and Dr. Whale could be there to save that life. Back to my ride with my mother back to town, she tells me that she finds my carriage (my car) strange. She then pulls out that ceramic piece Henry had made. We argue about her going into my home. She begins to tell me that Henry is not really mine and this is just infuriating me. I stop the car in front of the Rabbit Hole, and tell I want my son back. She tells me that all she wants is her daughter back and asks for forgiveness again. I begin to cry in my mother’s arms. In a whimpering state, I ask her how we can get Henry back. She tells me that she has a few thoughts. Now, Dr. Whale finally gets back to the hospital and says he is going to, “do this thing.” He nods at Ruby and heads to the operating room. The next thing we know, Ruby tells everyone Dr. Whale just saved the stranger. Dr. Whale confirms this and tells him the man is ready for anyone who wants to speak with him. Emma convinces the group to let her, the sheriff, speak with the man. In the mean time, Mr. Gold heads back to Belle’s hospital room with the chipped cup. He asks her to just look at it and concentrate. She remembers nothing and gets frustrated. She threw the cup and it shattered against the wall. She yells at Mr. Gold to leave. He slowly walks past the broken cup on the floor and leaves the room completely heartbroken. As for the injured stranger, Emma finally makes her way to his hospital room. She helps him with getting his cup of water and tries to clear up the night for him. He realizes that he hit a man and asks if that person was okay. She assures him the man is fine. Emma then asks him to recall what happened that night. He says that he was texting and driving and the next thing he knew he hit someone. She tells him that they are going to let him walk with a warning and when the doctor clears him, he can leave. Emma heads back to the group to let them know the story of how the stranger saw nothing. Everyone is relieved. The only person who is not doing well is Mr. Gold. He leaves the hospital and heads back to his pawnshop. He activates the magic orb that Cora gave him. He pricks his finger and a map appears. It shows him where his son is. Everything begins to settle down and Emma, Snow, Charming head back to their apartment. Henry is off school and they are going to enjoy a snack together. He asked about what is happening and learns that Dr. Whale’s alter ego is Victor Frankenstein. Henry goes to grab his storybook, and realizes that Frankenstein is not a fairytale. If Dr. Whale is not a fairy tale, there can be other stories out there. Who knows what other people too? Everything is interrupted by a knock on the door. Back at the hospital, the stranger hears his cell phone ringing. He goes to answer and calls the person honey. He tells her that she won’t believe what he saw.. It is a holiday and Victor is there with his father and brother. The trio has a toast as the father gives Gerhardt and Victor a gift. Gerhardt receives a pocket watch and Victor gets a commission certificate. The certificate is to send him away to practice medicine at the Mobile 34th. Victor does not want this; he wants to continue working in his lab. Victor and his father argue about Victor’s future. The father wins the argument and Victor is upset. Victor is in his lab packing up everything. Gerhardt shows up and gives the pocket watch to Victor. The brother then leaves and of course, Rumple shows up. He introduces himself and tells Victor that he is interested in his work. Rumple asks to make a deal. He offers a large amount of money if Victor can bring the dead back to life. Rumple wants to learn and he is willing to pay even more money. Rumple then disappears, and Igor comes down the stairs. Victor tells Igor that they are not leaving and to unpack everything. He also tells him that they need a body. 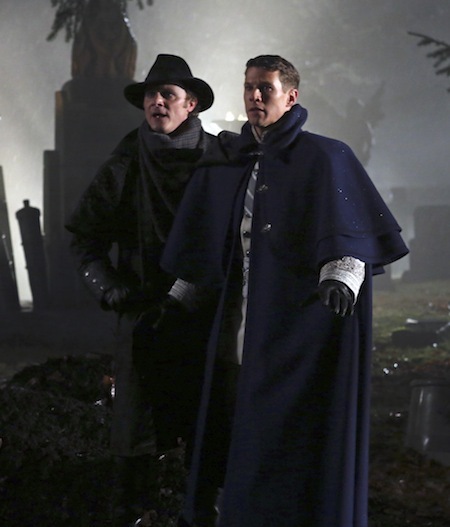 Next, they head to a graveyard where Victor is digging a grave. Gerhardt shows up and tries to reason with Victor about him digging a grave. Security shows up at the gate and shoots at the brothers. They hurry and jump into the carriage to get away. Victor begins to argue with Gerhardt about showing up, but to his surprise, Gerhardt was shot and dies. Gerhardt is dead and laying on Victor’s table in the lab. Victor is trying to bring him back to life with the assistance of Igor. The father comes down the stairs and sees his son dead. He blames Victor for this and tells him that he no longer has any children. The father leaves and Victor places Gerhardt in tub of water. Rumple then appears and asked how everything worked out. Victor explains to him that there is an issue with his brother’s heart. Rumple tells him he knows a woman who has hearts and he can introduce them. That woman is I.
Victor goes and meets me and gets a heart. Back to the lab, Victor begins to work. He brought his brother back to life. He says, “It’s now magic, it’s science.” He then hurries to show his father that Gerhardt is alive. Then father is holding a candle that upsets Gerhardt. The father sees that Gerhardt is not normal and calls him a monster. He yells at Victor and this upsets Gerhardt even more. He beats his father to the ground until he is dead. Gerhardt realizes what he has done and runs out of the house. Gerhardt is now in a holding cell. Victor comes in and talks with him. Gerhardt begins to attack him but stops when he realizes that is his brother. Victor pulls out a gun to end the life of his brother. He cannot bring himself to pull the trigger. Gerhardt turns to him, as Victor is still holding the gun, and points it at his own forehead. Victor says no and that their father was wrong. He will find a way and locks his brother in this cell and leaves.